Come and be astounded by the beauty of Fox Meadow homes! With backyard views of a lake plus plenty of greenery, you will feel as if you are at a private retreat! These luxurious homes are reasonably priced and highly desirable! An additional plus, there is golf available, an exercise room and pool! 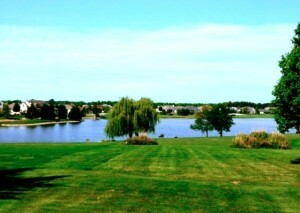 What more could you ask for besides the superb location of Medina Ohio! Fox Meadows has the option of colonial or ranch style homes suitable to your needs! Take advantage of single level living with soaring ceilings still giving your home a dramatic effect. The large windows allow for light to glow throughout, giving a bright airy touch. Fox Meadow homes have expansive layouts, each unique in style. Kitchens are a chef’s delight with expansive granite counter-tops, shiny oak cabinetry, breakfast bars and modern appliances. Relax in your attached morning room and enjoy the view! Separate dining areas with durable flooring provide the perfect space for family meals and entertaining guests! Relax in your great room near the gas fireplace during cold Ohio months! Bedrooms are decently sized with ample closet space. Master suites have high-rise ceilings and private bathrooms. Pick out a home featuring your own Jacuzzi tub, providing the perfect space to soothe a days stress away! Additional bathrooms are easily accessible and meet the needs of the whole family. With neutral carpeting and painted walls, each bedroom is awaiting your personal touch. Head down to the lower level where you will find elevated ceilings and ample storage space! Attached garages give the extra convenience for sheltering your car from damaging weather! Garages are oversized allowing enough room for a workspace! Fox Meadow homes are sure to peak your interest! Whether downsizing or wishing to take advantage of extra space, you’re sure to find a home fairly priced and tailored to your needs. Enjoy fine country living at its finest in Medina Ohio! Commuting is a breeze with I-71 just minutes away. Take advantage of the convenience of shopping, restaurants, top rated schools and no city taxes! Call one of our Medina home specialists today and find out more information! Contact us for a private showing of Fox Meadow Homes for Sale.